We have compiled solutions to the problems our users have most frequently faced in this FAQ. Please do go through the content of this page to see if any of the solutions can solve your problem. If you cannot find a solution, please then send us an email at help@languagedomus.com and we'll get back to you as soon as we can. The Merriam Webster dictionary defines a podcast as "a program (as of music or talk) made available in digital format for automatic download over the Internet." You can basically think of it as on-demand radio shows, even though videos can form part of the stream as well. You will need a podcast player to subscribe to and listen to your podcasts, and we recommend that you download iTunes if you do not already have it on your devices. Once you are subscribed to a podcast, new episodes will be automatically downloaded onto your player once they become available. You can then listen to the episodes, including learning Mandarin with Language Domus, at your convenience. I have subscribed to one of your podcast. However, I see only one episode in my podcast feed in iTunes. Why? If you are using iTunes, go to our podcast stream that you have subscribed to. You should see three tabs on the upper right corner of the feed. "My episodes" will show only the episodes that have been downloaded onto your device. "Feed" will show all episodes available for the podcast. The default setting for podcasts in iTunes is to download only the latest episode available, which is why you see only the latest episode in "my episodes". This setting is desirable if you do not want to take up too much space on your device, since you can still stream and listen to all the episodes under "feed" if you are on a wifi or a good mobile data network. 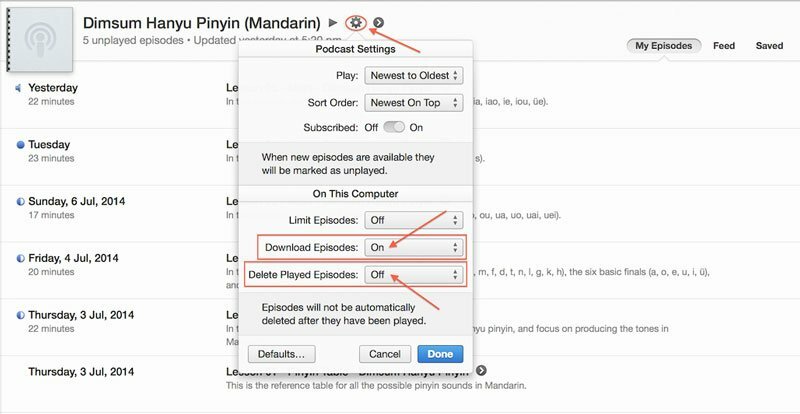 However, if you would like to change the settings such that you download all episodes, and also keep all episodes, you can go to setting as shown in the following photo, and select "download episodes" to "on", and "delete played episodes" to "off". How do I manually download episodes onto my device? For whatever reason, sometimes certain episodes are not downloaded automatically onto your device. To manually download an individual episode, go to the "feed" tab". Episodes which have not been downloaded onto your device will have an icon of a "cloud with a downward arrow" on the right side of it. Click on this icon to start downloading that episode. You should then see the download bar under the download icon at the top right corner of iTunes start moving. You can check on the status of the download by clicking on this download bar. Repeat this to download each episode that you want on your device. If I do not download the files onto my device, can I still listen to the podcast? If you are on wifi or a good mobile data network, it will be possible for you to stream the episodes from the "feed" tab as well. 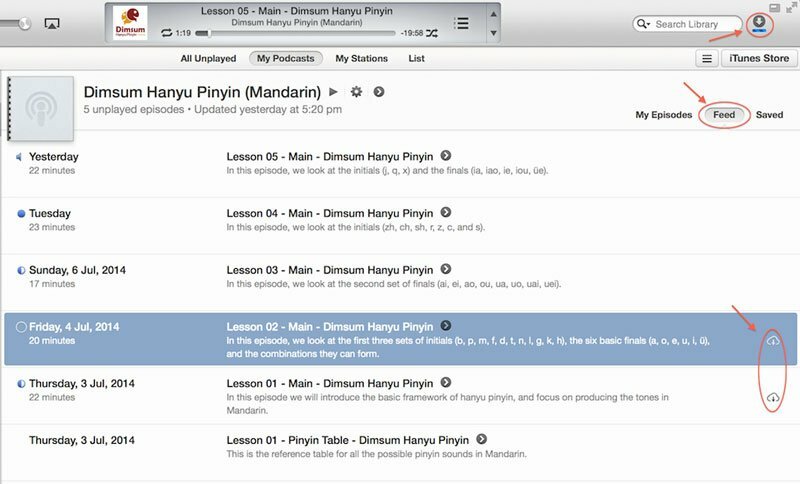 However, the PDF files, which include the hanyu pinyin table and the lesson guides, have to be downloaded before they can be viewed in iTunes. Also, enhanced podcasts have to be downloaded onto your device before the flashcards can be viewed properly through iTunes or Quicktime. When I click on the PDF files, why do the PDF files not open, and one of the mp3 files starts playing instead? 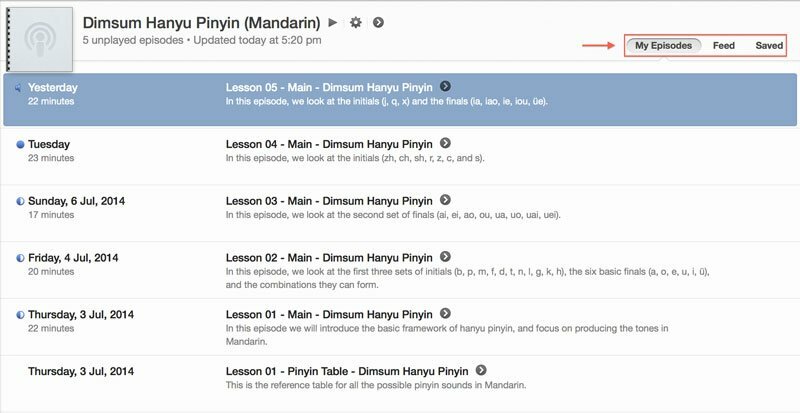 For the PDF files, which include the hanyu pinyin table and the lesson guides, you will have to make sure they are downloaded onto your device before you click on them. Refer to FAQ #3 for instructions on how to manually download the files onto your device. I cannot see the flashcards when I am streaming the enhanced podcasts. Why? Enhanced podcasts have to be downloaded onto your device before the flashcards can be viewed properly through iTunes or Quicktime. Refer to FAQ #3 for instructions on how to manually download the files onto your device.